For the most part, Lincoln Road property owners say they believe in the potential of the master plan designed by James Corner of New York City Highline fame, but they say they will only support it if the construction timeline can be drastically reduced. They also want Miami Beach officials to know they’re willing to put money behind it but they won’t spend it on infrastructure. Instead they want to create robust programs that will bring people to the street to mitigate damage to local businesses during construction. Last week, in a workshop with Mayor Dan Gelber and City Commissioners, property owners heard a request for $9 million from them to construct a signature trellis at the east entrance to the Lincoln Road pedestrian mall, provide for art in public places, and create a play area on an adjacent block on Euclid Avenue. Commissioner Ricky Arriola upped the ante, asking for a $20 million contribution from the property owners citing the street’s $1.9 billion in assessed property values. A follow up discussion this week amongst the Lincoln Road Business Improvement District (BID) Board of Directors was tense at times as owners asked why they should have to foot the bill for a public street. The BID is a special taxing district approved by the property owners to market and promote the street and advocate for the property owners and businesses on Lincoln Road. Though property owners paid half the cost of an $11 million renovation in 1994, they say the money was for non-infrastructure related costs. Since then, they say no other commercial property owners in Miami Beach have contributed to or been asked to contribute to area upgrades, pointing to Sunset Harbour and Española Way as examples. While property owners contributed to the recent upgrades to Coral Gables’ Miracle Mile and Giralda Plaza – a project being used as an example for BID participation here – Lincoln Road property owners bristled at the idea. Paul Cejas owns 420 Lincoln Road, a mixed-use building that houses office space, Zara and a Starbucks among others. He also owns a parking garage at 1601 Drexel Avenue adjacent to Lincoln Road. The retail space on the ground level of that building has been vacant since 2012. It is set to become a Time Out Market. “We did not lease one space [on Miracle Mile] during the time the project was underway,” she said, though Terranova founder and chairman Stephen Bittel added, “We did not lose one tenant” because they worked with them throughout the construction to mitigate the impact. “If it’s going to take five years, we’re all dead,” Cejas said. The group agreed a 24-month timeframe with a focus on getting the pedestrian mall finished first was their top priority. Proposed extensions in the 2-300 block, the block between Alton and West, and side streets should be done after the pedestrian mall, they said. Extending the BID beyond the current pedestrian mall to cover the additional construction areas received support from the group as well as the potential for contributing more money, but only if it’s used in ways that attract people to Lincoln Road. Bittel said “We need a shortened execution plan. If we can get that, I’m prepared to advocate forcefully for … a doubling of [the BID] tax per foot, tripling our budget.” The BID currently has a budget of $1.4 million. However, he said, 100% of the money would go “to increase marketing and art in public places.” He also suggested the BID take over the licensing of artists that perform on the street from the City. “It’s worth every penny if you can get that [construction] period shortened,” Schlesser said. McIlroy told Adrian Morales, Miami Beach Property Management Director, “Nights, weekends, whatever it takes” to keep the construction moving. “It didn’t feel like an opening conversation,” Bittel shot back. “Lincoln Road with no Convention Center still saw about 12 million people [last year] which is an amazing number,” Stern said. He urged moving forward with “Lincoln Road 2.0 while things are still strong” adding “We just want to spend more intelligently than they’re asking us to” with the $9 million request for the trellis, playground, and art in public places. 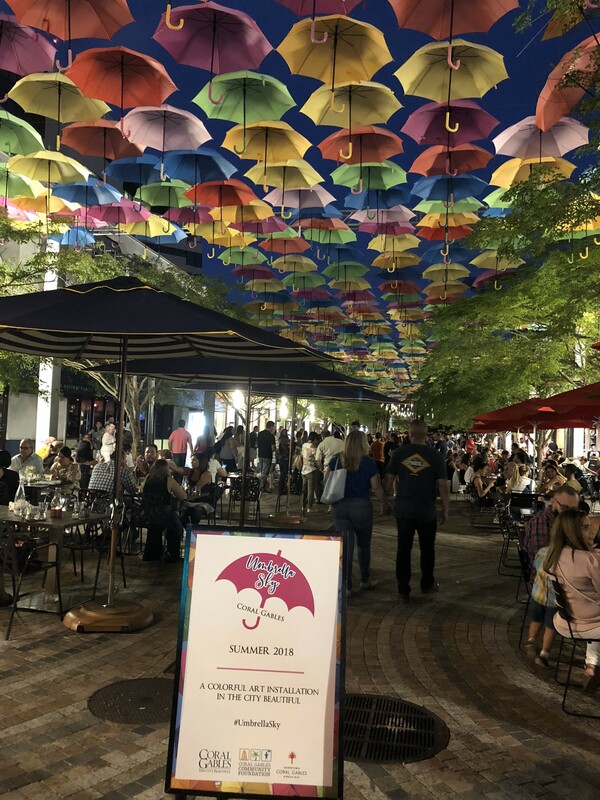 At last week’s Commission workshop, Bittel referenced the temporary Umbrella Sky art installation which was designed to bring people back to Giralda Plaza after construction was completed and which caused a sensation on social media. “Traffic exceeded everyone’s wildest expectations. It’s still packed and the umbrellas are long gone," he said. The installation reportedly cost $94,000 and was shared by the City of Coral Gables, the Coral Gables Community Foundation, and the Coral Gables BID. Stern said, “We heard loud and clear about business disruption and mitigation” from City leaders as well as property and business owners. “We need to activate the road now so everyone survives.” Waiting until after construction wasn’t an option for the group. BID President Steven Gombinski said “I believe the master plan can change the future of Lincoln Road making us much more competitive.” Gombinski owns the building at 900 Lincoln Road. “It says a lot about the importance of what we’re discussing,” Schlesser responded.